The great PR debate rages on whether Tiger Woods’ strategy for reclaiming his reputation worked, and whether the mea culpa performance last Friday helped or harmed his future. But hey, the proof is in the pudding. You can debate whether Tiger was wooden or sincere, and if his attempted manipulation hindered or helped. But an online analysis that we performed internal to Gregory FCA shows his strategy failed … miserably. 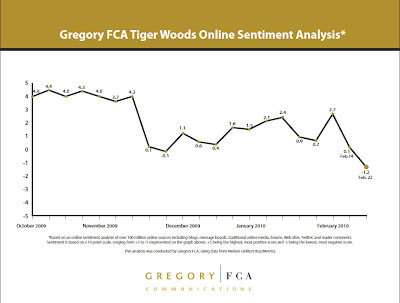 By analyzing over 100 million blogs, forums, message boards, tweets, and traditional media over the weekend, we discovered that, as of today, Tiger’s sentiment among the American public is lower than at any time since the controversy erupted last November. It has fallen further since his so-called press conference. Our analysis was conducted using data provided by Nielsen BuzzMetrics. It shows that Tiger’s sentiment score with the American public now stands at -1.2 on a 10-point scale, with -5 being the lowest and 5 being the highest. As you can see, before the controversy, Tiger enjoyed a near perfect 4.2 sentiment score. In November, when word of his SUV crash became public, his sentiment fell off a Pebble Beach cliff, scoring nearly 0. Surprisingly, and noteworthy, his silence over the past three months improved his sentiment. As of early February, Tiger had reclaimed some of his lost reputation, scoring 2.7 on the sentiment scale. It makes you wonder whether Tiger should have stayed quiet longer, and if the American public believes salvation only comes after a long, contemplative period of penance — and not after just three months. After the press conference, Tiger’s sentiment plunged. It now stands at a rock bottom -1.2, one of the lowest scores we have ever measured for a personality, brand, or company. What accounts for the failure? Perhaps it’s due to his handlers and their use of traditional reputation management techniques in an era when opinion is built and maintained in so many non-traditional ways. They used the old-school strategy of disappear, re-appear, blame addiction, claim rehabilitation, and ask forgiveness, all the while attempting to manipulate and control the message, right down to who’s in the room and restricting questions. It just didn’t work. It’s said that Gary Hart’s Monkey Business ordeal came as the media landscape was changing due to 24/7 news cycles and sensationalism. Hart failed to realize that the private lives of politicians were no longer off limits to public scrutiny. He thumbed his nose, and challenged the media to catch him. They did, and the results were insurmountable. As noted by sports broadcaster Jim Gray (who chose to boycott the sham conference), instead of going before a stiff, albeit supportive audience, Tiger should have produced a YouTube video or a series of YouTube videos in a more casual and believable setting. He should have connected directly with his fans and the media, through comments and interaction on the YouTube video page. He should have tweeted about the experience, and promised to keep his fans updated as he continues to evolve his career. Ironically, YouTube and other social tools would have given Tiger the control he craved, as well as the authenticity that reality TV and the Internet have conditioned people to expect, even when the message is contrived. It was a major missed opportunity, like shanking the approach on the 72nd hole. But it was easily understood coming from Tiger, who seems to be living in a 1960s “Mad Men” world, where men leave their families each weekend for golf, cheat freely on their wives, think they can control and manipulate people, and in the end, all will be forgiven.